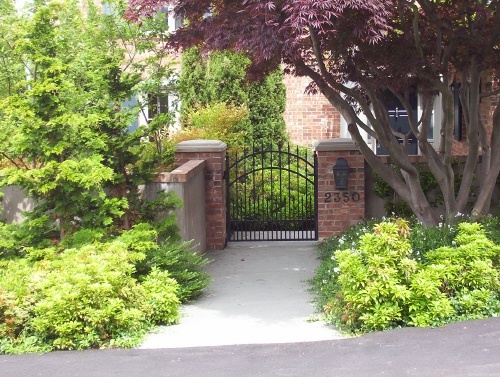 This garden in the Blue Ridge neighborhood of northwest Seattle is really two distinctly different gardens. 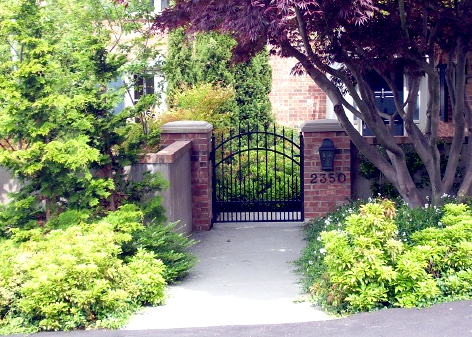 Adjoining a classic Italianate loggia and the simple brick faade of the house, the front garden is an elegant, inwardly-focussed urban courtyard with European flair. 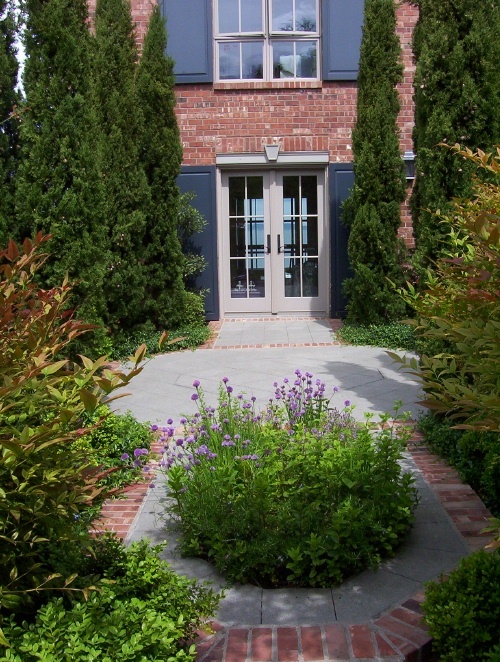 Dressed up with stucco walls and an ornamental iron gate, the garden features Italian Cypress trees placed formally around an octagonal space for outdoor seating and a small stone bench on axis with a set of French doors from the living room. 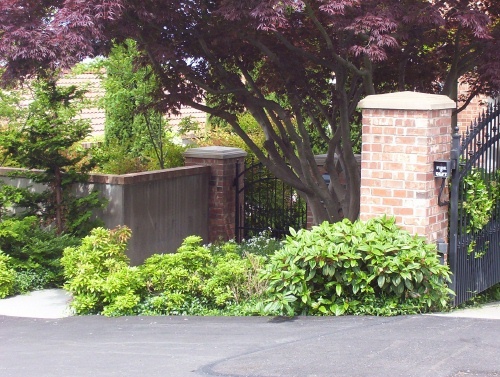 The walls and gate were carefully placed to set off the sculptural limbs of a large, well-groomed Japanese Maple tree which beckons visitors toward the front gate. 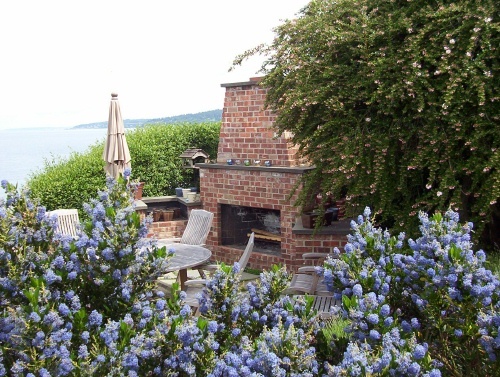 By contrast, the sunny, west-facing back garden takes prime advantage of the sites prominent position on a bluff overlooking Puget Sound and the Olympic Mountains. 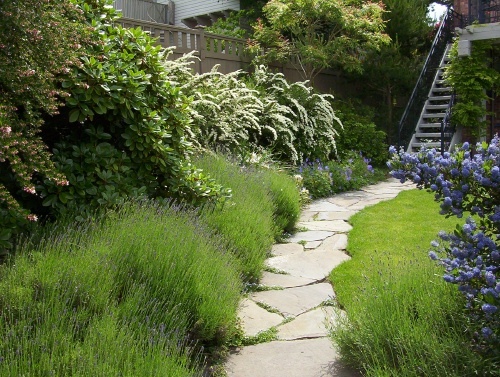 Although the residence does not have beach access due to the train tracks which pass below, Seattle landscape architect Brooks Kolb employed sweeping lawns with perennial borders and low orchard trees to create the feel of a waterfront garden. 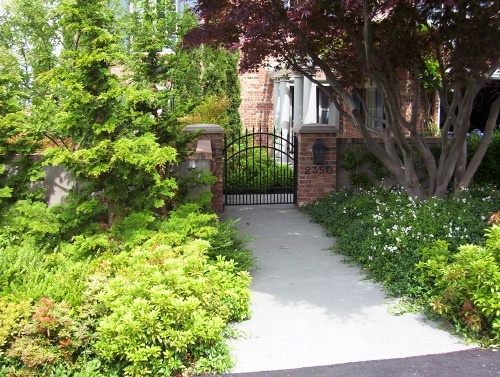 Outdoor living is facilitated by an upper deck and two paved terraces a concrete patio adjoining the east elevation of the house and a partially concealed bluestone terrace nestled into the top of the bluff, centering on a brick outdoor fireplace. 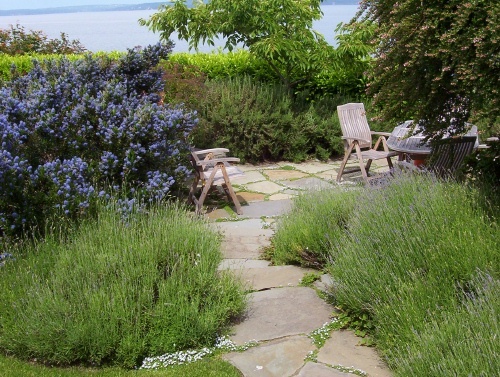 To enhance the sense of surprise or mystery, this terrace is separated from the lawn by an abrupt slope planted with a tall screen of Ceanothus and Rockrose shrubs.